The 2nd meeting of the Steering Committee for the construction of the proposed Abidjan–Lagos Highway project took place in Accra. The conference was attended by experts, Ministers of Road, Infrastructure, Works and Justice from Nigeria, Benin, Togo, Ghana and Cote D’ivoire are to discuss the necessary preparatory activities before the execution of the project. Mr. Amin Amidu Sulemani, Minister of Roads and Highways, addressing the opening ceremony emphasized the significance of the project to Ghana because more than 50 per cent of the highway lies in the territorial boundaries of the country. Mr. Sulemani said the President of Ghana attached the highest priority to the project. He stressed the need for the stakeholders to prepare the project very well, give adequate timeline and ensure that the implementation, operation and management achieved the objectives of the ECOWAS Protocols and decisions relating to the harmonization of transport and transit laws and regulations across the sub-region. Mr. Sulemani said the success of the project would be measured by the effectiveness of the integration of the people of the sub-region. Mr Sulemani also stated the need to integrate the initiatives of the individual states into the planning and implementation of the project. “We must, however, not compromise on technical and operational standards on the various sections. Any initiative must conform to the overall standards for the Highway,” he added. Mr Mike Oziegbe Onolememen, Minister of Works, Nigeria and Chairman of the Steering Committee of the Abidjan–Lagos Highway project stated that the mandate of the group was to prepare the blueprint for the project as well as oversee its actualization. He said since the last meeting of the committee on July 17, 2013 in Abuja, a lot of presentations had been made to the Presidents and Heads of Governments in line with their approval towards the realization of the Abidjan–Lagos Highway project. He said letters had also been forwarded to the President of the African Development Bank (AfDB) to fund the detailed engineering design as well as appointing the African Finance Corporation (AFC) as the financial advisor for the project. Mr. Onolememen also stated that the recommendations of the experts were now before Steering Committee for consideration which includes the terms of reference for the feasibility studies and the detailed engineering design, the treaty to be signed by the five member states and the highway manual of operation. He said the documents before the committee were crucial to the success of the project as they form the foundation upon which all aspects of the project would stand. “We must examine the document thoroughly to ensure the smooth sail of the project” he said. Mr Onolememen further noted that if the recommendations arising from the meeting were approved by the Presidents and Heads of Governments during their meeting in October, 2013, it would lead to a binding agreement by all the parties, which would be a landmark achievement in the realization of the Lagos-Abidjan highway project. He, therefore, enjoined the participant to feel free and make constructive observations in the review of the documents. He said the commitment of the Committee members to the project should not be diluted since their leaders had shown unwavering support for the project as demonstrated in their willingness to provide the necessary support to all activities and processes geared towards the realization of the project. 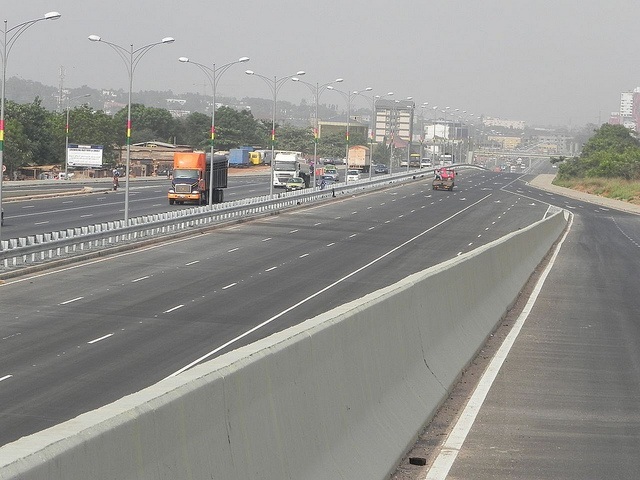 Ministers of Infrastructure and Justice of the five ECOWAS Member States involved in the implementation of the 1,028-kilometre (638.76 miles) Abidjan-Lagos corridor road project held a meeting in Accra on Friday, 20th September 2013 to finalize and adopt the project’s two key documents. 1. The third meeting of the Steering Committee of the Abidjan-Lagos Highway Corridor Project was held on 20th September2013 at the La Palm Royal Beach Hotel in Accra – Ghana. 2. The meeting was convened by the Steering Committee through the Chairman, Honorable Minister of Works of Nigeria, His Excellency Arc. Mike O. ONOLEMEMEN. 3. The meeting was convened in compliance with the directives of the Presidents and Heads of States and Governments (HOSG) of member States involved in the Project (Cote d’Ivoire, Ghana, Togo, Benin and Nigeria) at the margins of the 53rd meeting of ECOWAS Summit in Abuja-Nigeria on 18th July, 2013. In this meeting of the HOSG in Abuja, the Chairman of the Committee was instructed to report the progress of the project to the Presidents in all their Summits, with the next Summit scheduled to be held on 25th October, 2013 in Dakar, Senegal. (ii) Proceed to develop the Tender documents for the recruitment of consultants for the Study. 7. Regarding the funding mechanism and the resources mobilization, the Committee underscored the need for Member States to contribute some seed money to support feasibility and design studies as a sign of their commitment to attract investors and financial institutions. 8. Regarding the acquisition of the right of way, payment of compensation and resettlement matters, it was agreed that Member States should immediately commence the necessary processes to acquire same. They agreed that in the spirit of the project being implemented as a single unit with a supra-national status, the cost of compensation will be covered jointly under the project. funding of the feasibility and design studies. 10. In connection with the Treaty, the Meeting accepted the draft Treaty and agreed to address the document to their respective Ministers of Justice for further consultations. Consequently, they gave the Legal experts three (3) weeks to further consider the draft Treaty and finalize at a meeting at the ECOWAS Commission on 10th October, 2013.
a) The Steering Committee will coordinate issues relating to the mobilization of funds. b) Consultations will be made with the relevant Ministers when necessary, to facilitate the implementation of the project. c) Engage the services of a Transaction Advisor for the project through competitive bidding processes, to assist in efficient packaging of the project and to bring all financing structures together for smooth implementation. 13. Lastly, the Ministers’ Meeting expresses its profound gratitude to His Excellency, John Dramani Mahama, President of the Republic of Ghana, the Government and People of Ghana for the warm welcome and authentic African hospitality extended to it during its stay in Accra.